Adding some depth and dimension to brunette hair is easy. There are seemingly endless possibilities for highlighting, from edgy to subtle. Whether you're looking for face-framing warmth or want more highlights to add overall dimension, it's not difficult to get the effect you want. Using different techniques with different size toothbrushes and a do-it-yourself (DIY) kit can potentially save on expensive trips to the salon. Highlighting your hair at home requires you to invest in one of the many DIY kits available for dark hair. They are affordable, ranging from $7 to $15, and can be found in your local supermarket, pharmacy, or mass merchandise store. Choose a shade that is relatively in the same color family as your hair. The general rule of thumb is to avoid going more than two to three shades lighter than your 'base', which is also known as your natural hair color. However, if a more dramatic highlight is preferred this guideline does not apply. Revlon Frost & Glow Highlighting Kit Honey: This kit will help you achieve honey-colored highlights. L'Oreal Frost & Design H65: This kit will produce caramel-like highlights. Garnier Nutrisse Highlighting Kit: This option will produce warm-bronze highlights. Open your box and make sure you have everything out, peeling the gloves from the back of the instructions. You will not need the cap or the applicator in the box - just the color, gloves, and timing instructions. Mix your products together according to the directions. Put the gloves on and make sure you're wearing an old t-shirt. Choose the appropriate toothbrush based on how much of a highlight you desire. If you're looking to color larger pieces to highlight, use a regular adult toothbrush. If you'd like a slightly highlighted look, choose a toddler toothbrush. If you want very little highlight choose an extra-small toothbrush. Note that brunette hair develops in these stages: first it lifts light brown, red, then orange, and then yellow, pale yellow, then blonde. A strand test is the best way to eliminate any guesswork and achieve the desired results. The way you apply the color to your hair will depend on whether you prefer face-framing highlights or sun-kissed highlights. Face-framing highlights are easy and require very little skill. Part your hair the way you normally wear it. Decide which hair around your face you'd like to highlight. 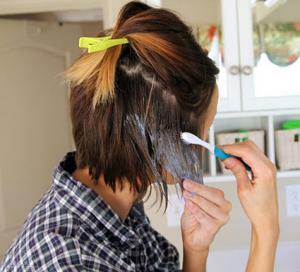 Pull the remaining hair (that will not be highlighted) back into a ponytail so it's away from your face. Dip the toothbrush bristles into the hair color formula. A regular adult toothbrush is generally best for this option. When in doubt, though, start out with a smaller toothbrush first and see the results after drying your hair. If necessary, you can always add more highlights gradually until the desired look is achieved. Start about 1/3 of an inch (1 cm) away from the scalp and paint the hair to be highlighted down to the end. When you have painted both sides of the hair around your face it should look like you have two wet tails hanging. Leave color on your hair the amount of time noted in the instructions from the kit or based on your strand test. It could take all summer to get beautiful sunny highlights naturally. Fortunately, this highlighting technique is easy and quick with the right tools. Pull the rest of your hair back into a ponytail. Dip the bristles of the large toothbrush into the hair color formula. Start about 1/3 of an inch (1 cm) away from the scalp and paint the hair down to the end. Take remainder hair out of ponytail. The addition of highlights can create a whole new look. Not only do highlights mimic the sun's natural lightening effects and lend your locks a fresh, casual look, they also add intense contrast. This is especially true for brunettes, who can choose among an assortment of colors to achieve a number of different looks. Some shades will create a playful, youthful appearance while others instantly up the glamor factor. Basic highlighting at home does not require advanced techniques. Depending on your intention, you can play with various shades or ask your stylist to recommend a hue that will best enhance your features. Keep in mind that highlights look most authentic with multiple colors, though this technique generally requires a licensed professional.